The 16 km-long Erlangen section (milepost 16.52 to 32.40) starts to the south of Eltersdorf and extends through Erlangen station to Baiersdorf. A right to build exists following completion of a public law process. Construction work started on an approximately three kilometre-long section of line between Erlangen-Bruck and Erlangen station in November 2011 (project designation: four-track line upgrade Paul-Gossen-Strasse - Erlangen station, milepost 20.96 to 23.95). This initial stage of construction demands investment of approximately 50 million euros. The trackbed is being extended from two to four tracks. The widened trackbed is protected by retaining walls in a cutting. Retaining walls also secure the newly-created embankment. 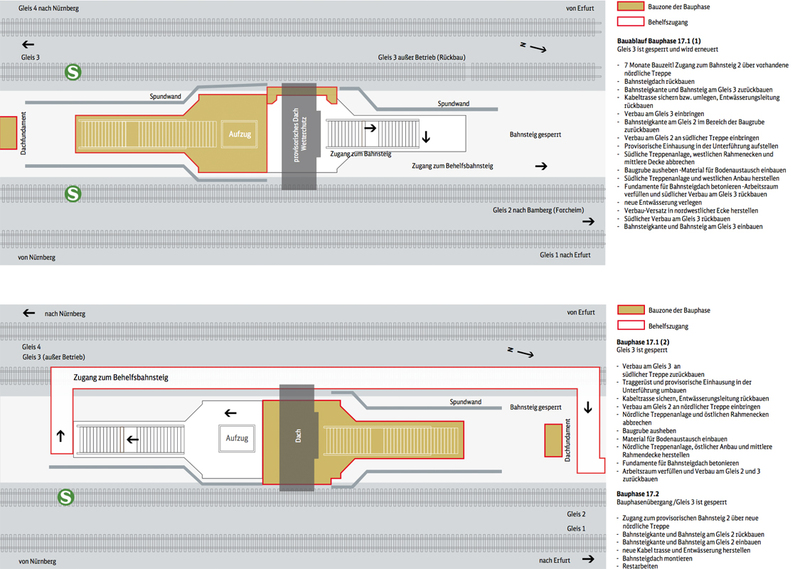 The first phase covers the line from Eltersdorf station to Erlangen-Paul-Gossen-Strasse stations. The retaining walls are being installed to protect adjacent development from the effects of the widening of the railway trackbed. Trees had to be felled and undergrowth removed before the actual construction work could begin. The tracks and platforms at Erlangen station are being renewed. The work includes the canopy over island platforms 2 and 3, to protect passengers from wind and rain in future. The new stairs are being complemented by a new lift, benefiting less mobile travellers, parents with buggies and cyclists. Long-distance platforms 1 and 4 and the existing entrances to the pedestrian subway are remaining largely unchanged. Changing from local to long-distance services and town buses will be more convenient for everyone after this upgrade. Construction while trains are running represents a particular challenge. The entire construction process has therefore been broken down into individual phases. Parts of the track or platforms are being taken out of service for a certain period to enable construction to proceed. The respective section will be reconnected to the network on completion of the upgrade and work commenced on the next phase. Rail traffic may be restricted during the changeovers between two construction phases. Passengers are being informed of alternatives in good time. This road bridge is being completely rebuilt as a road and rail interchange and is getting a new rapid transit stop on the line under the bridge. A four-lane road crosses the tracks here. Waiting areas with bus bays are being provided on either side. A cycle track and footpath 4.25 m wide runs along both sides. Steps and a lift lead from the bus stops to the new island platform in the centre below the bridge. The entire surface area of the bridge measures 47 x 35 metres, so it is about the same size as an ice hockey pitch.